Spread and Application Forged Aluminum Pistons How Yamaha’s Forging Technology Has Evolved - Yamaha Motor's Waza and Sube | YAMAHA MOTOR CO., LTD.
An exciting aura always surrounds the launch of an all-new motorcycle. At the unveiling ceremony, it’s common to see members of the development team smiling brightly as they proudly present the new model. The machine is photographed from all different angles and well-known journalists take their time sitting on it for the first time, bringing an additional dash of fulfillment to the team’s big moment. Although it is seldom brought to light at these celebratory events, a major contributor to the form and end-performance of new models is the technology behind the manufacturing that makes them possible in the first place. Manufacturing technology is what actually translates the aims and the intentions of the designers into viable manufacturing and production methods—all while satisfying various engineering requirements—and it is the often overlooked aspect that turns ideals into reality. Although it happens behind the scenes, it forms the essential basis and irreplaceable core of Yamaha Monozukuri (an approach to engineering, manufacturing and marketing products that emphasizes craftsmanship and excellence). Ever since our founding in 1955, Yamaha Motor has placed prime importance on manufacturing technology and has continued to develop and refine this expertise. One could say the very backbone of Yamaha Motor as a company is the casting and forging technology that shapes raw metals into the high-precision parts that compose our products. While many manufacturers choose to outsource metalworking or purchase such technology under license out of concern for business efficiency, Yamaha has steadily and painstakingly worked for decades to develop numerous manufacturing technologies in-house. A good example of this is Yamaha’s forged aluminum pistons. Besides enabling a thinner construction and lower weight, these pistons are stronger and more durable, enabling us to build higher-revving engines that feature greater reliability as well as higher fuel efficiency. In short, they bring nothing but benefits. Forged aluminum pistons were originally used for racecar engines and similar applications. With the complexity of the production method and the difficulty of successfully forming the detailed shapes of a piston, it was said that the technological hurdles were too high to effectively employ them in a production motorcycle. 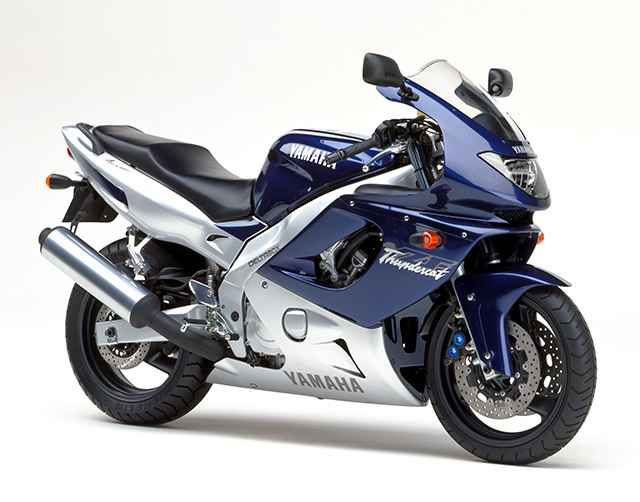 But, in order to take advantage of the high level of strength forged aluminum pistons retain at high temperatures and increase the performance potential of its motorcycles, Yamaha took on that challenge and succeeded in fitting its 1996 YZF1000R Thunderace and YZF600R Thundercat (#1) with such pistons. To further build on this success, Yamaha turned its attention to aluminum as a material and the release agent injected into the mold to aid in removing the finished piece. By fine-tuning the composition of this release agent and the forging conditions (temperatures for the aluminum, mold, etc. ), Yamaha created a single-press forging method that enabled mass production of complex-shaped pistons. Yamaha succeeded in creating mass-produced forged aluminum pistons in 1997, and it was the world’s first case (#2) of mass-producing pistons via forging, something that had been regarded as too difficult to accomplish. These pistons were first adopted on the 1999 YZF-R6 and YZF-R7 before being employed with greater frequency on subsequent models primarily in the supersport category. 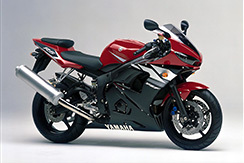 Today, forged aluminum pistons are used in numerous Yamaha motorcycles. One of the Yamaha engineers involved in the development of this technology says, “There’s a certain importance in us creating these technologies ourselves. Since we have a thorough understanding of the requirements we need to clear, this allows us to not only simplify the manufacturing process but sometimes also reduce costs.” Through repeated trial and error, the eventual success in creating a new manufacturing process in-house truly makes it a Yamaha technology. By then making the process adaptable, it can be utilized across a larger number of products. The examples of this proliferation are virtually innumerable. With Yamaha’s Controlled Filling (CF) aluminum die-casting technology first used for the YZF-R6 (#3) released in 2003, measures like increasing the degree of vacuum in the die, better control of die temperature and increasing the injection speed of the molten aluminum enabled mass production of high-quality cast aluminum parts. With this technology it became possible to cast larger pieces with thin-walled sections while reducing the number of component parts needed, reducing the amount of aluminum used and simplifying the manufacturing process. All this can result in reduced production costs and a smaller environmental footprint. CF aluminum die-casting technology is another example of technology that is now used on a wide range of Yamaha motorcycles, and it is also a technology that contributed to Yamaha’s success in developing the DiASil Cylinder, which uses an aluminum alloy containing a high silicon ratio of 20%. Furthermore, by optimizing the CF die-casting method to fit the manufacturing process for magnesium parts, it developed into Yamaha’s own “CF magnesium die-casting technology,” thus demonstrating how our casting methods and expertise continue to evolve. Almost all of the new models that make their debuts with the fanfare we described at the beginning are beneficiaries of this continuous evolution of manufacturing technology. Should you have an opportunity to attend such an unveiling, looking for where such manufacturing technologies are hidden away in the machine may bring added enjoyment to your time at the event. (#1)The YZF600R Thundercat used forged pistons. (#3)The swingarm for the 2003 YZF-R6 was made using CF aluminum die-casting.